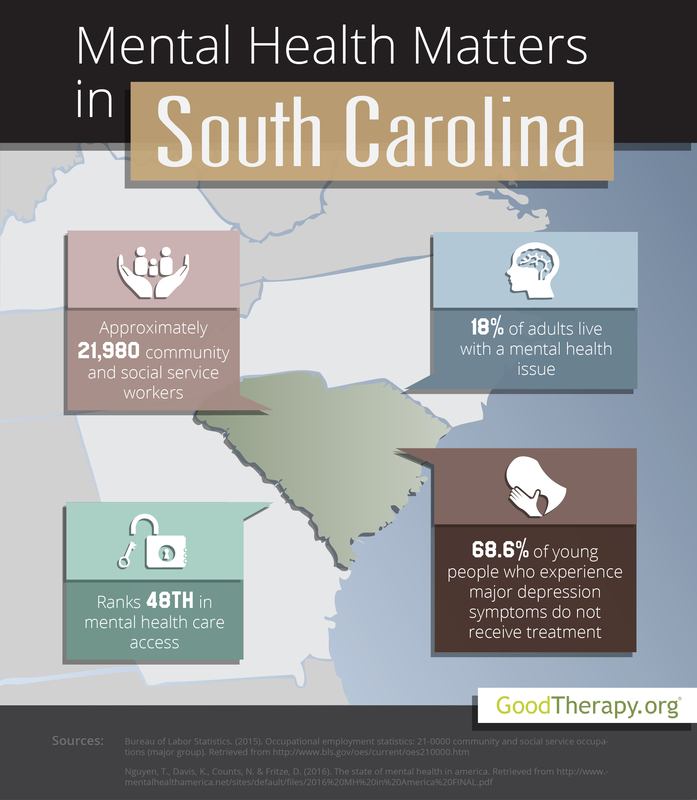 Find a therapist in South Carolina with GoodTherapy.org. Nearly 4.9 million people lived in South Carolina in 2015, as reported by the United States Census Bureau. Census data states 68.4% of the population is white, 27.9% is black, and 1.6% is Asian. About 22.3% of all residents are under the age of 18, while 16.2% are age 65 or older. Approximately 51.4% of the population is female. Approximately 21,980 South Carolina residents worked in community assistance and social service fields in 2015, earning an average salary of about $40,000. In 2016, Mental Health America (MHA) compared all states and the District of Columbia for current mental and behavioral health standards. After the survey was completed, the state of South Carolina was 38th in adult ranking, 43rd in youth ranking, 23rd in prevalence of adverse mental and behavioral health issues, and 48th in access to mental health care. Researchers who conducted the survey and some therapists in South Carolina believe the state’s low access to care ranking correlates with several local socioeconomic features such as low rates of graduation for students with disabilities, and high rates of unemployment, obesity, violent crime, and poverty. South Carolina received an overall mental health rank of 38th, placing in the lower half of the list. Mental health issues affected a little more than 18% of the adult population in South Carolina. Approximately 8.2% of people in the state have substance abuse issues, and 4% have had serious thoughts of suicide. Among the younger population, 5.7% use drugs or alcohol, while 7.4% have severe depression symptoms. Residents in need of care may experience some barriers to receiving treatment. The state was ranked 38th in mental health workforce availability, with a ratio of 702 residents to each mental health provider or therapist. In South Carolina, 30.2% of adults with mental health issues have no mental health coverage, and 31.6% of adults with a disability could not afford the cost of treatment. In 2016, the state was ranked 42nd for children with private insurance that does not provide mental health coverage, and 46th for young people with severe major depression symptoms who did not receive treatment. According to a 2014 report from the Substance Abuse and Mental Health Services Administration (SAMHSA), 59.7% of teenagers in South Carolina report improved functioning after receiving treatment from the public mental health system—a figure lower than the national average of 69.3%.